When I was at opera school my drama teacher said Mimi was a trollop, who knew that 4 young men shared an apartment in the same house as her and is determined to ensnare one of them. He maintained that she waited for one of them to be alone and then pretended her candle has gone out. But unlike many Puccini heroines, Mimi is not a man's victim. She's a determined young woman who gets what she wants - love and passion. She didn't sit alone in her attic waiting for love to come to her - she went out and found it. In Vissi d'arte the students at the opera school have to act of scenes from opera. Here is the scene where Natasha and Richard work on their scene from La Boheme. In the final moments of the scene Richard walked up to Natasha. “You look lovely in the moonlight.” He came closer, but instead of just gazing at her as they had planned, he kissed her on the lips. To his joy, she responded enthusiastically, and put her arms round his neck. Reluctantly, he pulled away, trying to control his excitement. Natasha buried her head in his shoulder, and he felt her heart pounding. She parted her lips and he kissed her again. “This isn’t in the script,” he said breathlessly. He kissed her again and when he tried to pull away she resisted. “This is the first time I’ve ever looked forward to Monday,” he said, stroking her hair. 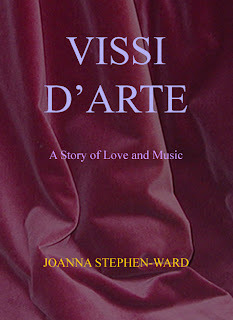 Vissi d'arte the novel about young opera singers is now available as a paperback from Amazon. Mystery, love, conflict and ambition. Kindle editions are also available.